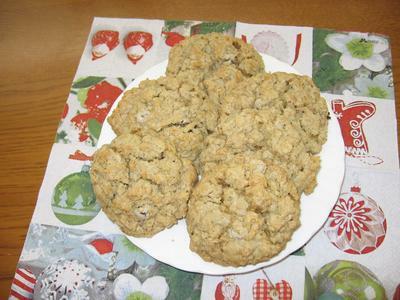 This is the original Quaker Oats oatmeal cookie recipe that I have been making for years, since my adult children were in diapers. I haven't modified it too much from the original except that I now prefer to make them with chocolate chips and nuts rather than raisins. This is one of those very reliable recipes that always seems to turn out very good tasting cookies. I consider this my favorite, easy-to-make, go to "never-fail" favorite cookie recipe. Beat together shortening, sugars, egg, water and vanilla until creamy. Add combined remaining ingredients; mix well. Drop by rounded teaspoons (or small cookie scoop) onto greased cookie sheet. Bake at 350F degrees for 12 to 15 minutes. Place on wire racks to cool completely and store in airtight containers. I'm a huge fan of oatmeal chocolate chip cookies and these are some of the best ever!